Found one file extension association related to Europa Universalis 2 and 1 file format developed specifically for use with Europa Universalis 2. Europa Universalis 2 invites you to a global struggle for supremacy from the dark times of Jeanne D'Arc to the flaming wars of Napoleon. As the leader of a country you have to guide domestic and foreign policies. Engage in religious struggles, set up expeditions to claim the New World, lead your country to prosperity and victory. Send your Privateers to roam the seven seas, muster mercenaries to bolster your defences, and send missionaries to convert infidels to your State Religion. 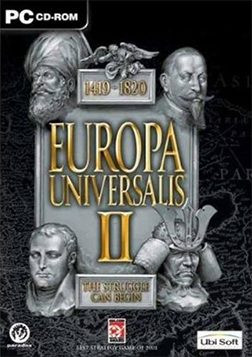 The Europa Universalis 2 software seems to be old or discontinued. If you need more information please contact the developers of Europa Universalis 2 (Paradox Interactive), or check out their product website.